It sounds like the name of an ergonomic screwdriver or newfangled bicycle seat – but as the picture above shows, I’ve been installing the fabric valance over the layout. Named after my friend Pierre Oliver (who suggested I take a theatrical approach to framing the scene), The Oliver Ouchless won’t bash my skull when I lean in to work on the layout. 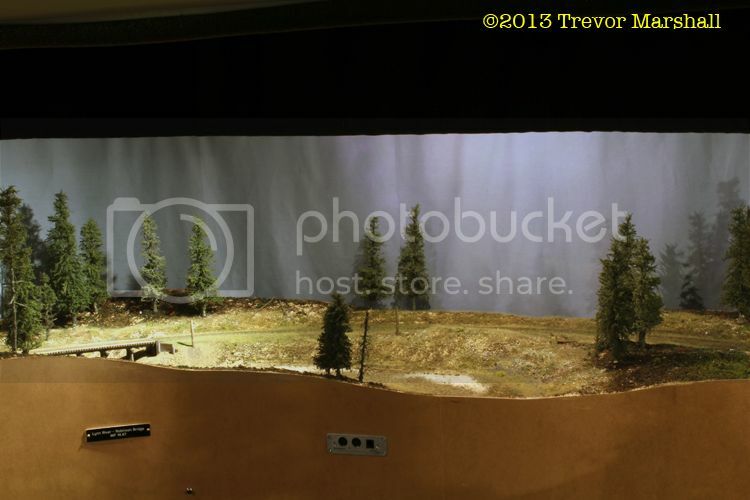 All photos in this post were shot at my eye-level, so they show the layout as a typical operator would view it. The photo above shows St. Williams to the left and ahead, and Port Rowan to the right. Putting the operating aisle in shadow like this really throws the attention on the layout. I’m very pleased with the effect, which will be even better when I paint the fascia black to match the valance. My wife and I are sewing the valance in sections to fit around various ceiling fixtures such as pipes and ducts. We have most of the major sections done, which have a 16.5″ drop from the ceiling. There are a few smaller pieces to do between these large sections. Sections are attached to the previously-installed valance supports using Velcro. I’m also putting short strips of Velcro at section ends to link the sections together: This keeps light from leaking between them. And since the valance is sewn from a doubled-over piece of fabric to ensure that the layout lighting does not bleed through it, it’s also easy to insert a length of chain into each section to weight the valance. This helps the valance to hang straight. I bought some chain to test this and I’m happy with the result. Some of the valance sections are so-weighted: Others will get chain tomorrow, when I pick up more at the local hardware store. More photos below. Thanks for the idea, Pierre – The Oliver Ouchless is perfect! 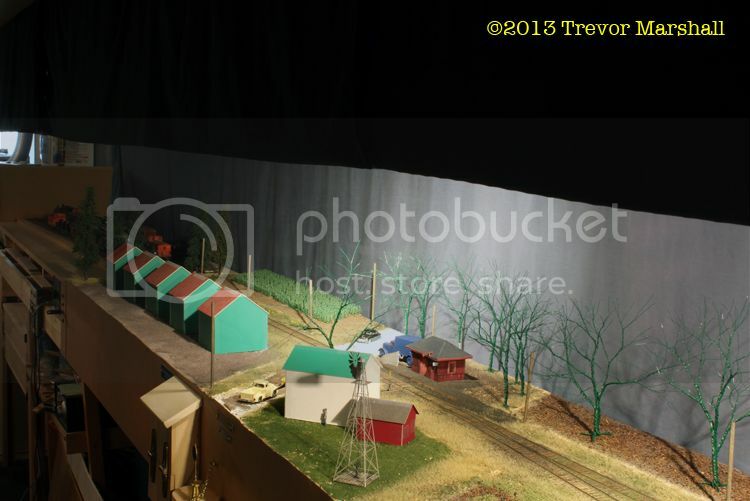 This entry was posted in lighting, valance and backdrop by Trevor. Bookmark the permalink. A stunning presentation that will only get better. This is looking really great Trevor! The use of 1x2s on the ceiling in conjunction with Velcro is genius – and especially timely since I’ve been stuck for a bit on how best to do my valence. 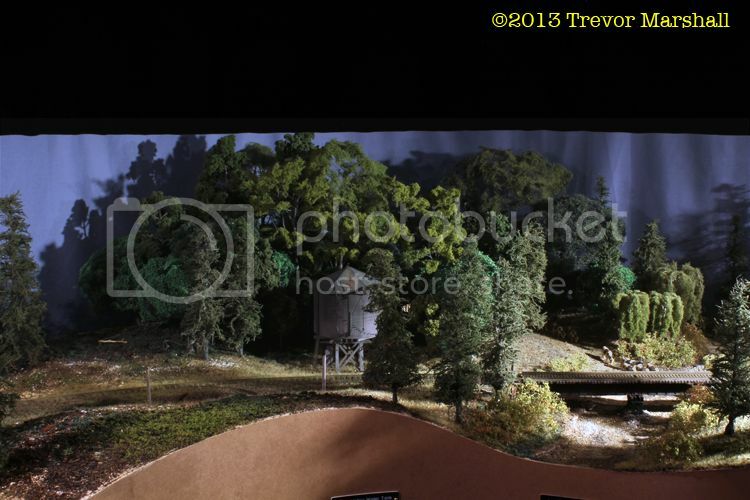 One question though: does it bother you that the front of the scenes are in shadow? Or is the lighting not fully done yet? Reason I ask is that when I installed my lighting it was important – to me anyway – to be sure to light from the front of the scene (i.e. from the fascia) on back. But I’ve discovered that that creates a different problem – where to put the valence. Having the lights basically right over the fascia means that the valence has to be out more in the aisle, which in turn means that everytime somebody needs to reach into the scene/layout to work (coupling/spotting) they’ll need to lean in under the valance – and have all the lighting exposed to their eyes. So much for the purpose of the valence! Locating the lighting further away from the aisle and more into/over the scene would go a long way to solving that problem, I suspect. But then the front of the scene isn’t lit (much). That looks like the route you took, so just interested in your thought process for locating the lighting – since that seems (to me anyway) to drive valence location. Sorry for the long comment/question. REALLY enjoying your blog and following your progress. As you can hopefully tell, I’m learning a lot along the way too! Thanks for writing – and I’m glad you’re finding this timely and useful. I’m not worried at all about the front of the scenes being in shadow. It puts more focus on the trains, and de-emphasizes the break between layout and aisle. You’re right – it drives valence location. If the valence is high enough then people can slip under it – especially easy if the valence is The Oliver Ouchless. But then their heads can cast shadows where they work too. Never apologies for commenting or asking questions. I’m always happy to hear from readers and discuss what I’m doing. They effect looks fantastic, the black fascia will really improve things. I never thought about using a “stage curtain” as a valence. Until Chris mentioned it in an above comment, I never noticed the area at the front of the layout/aisle is a little darker. I have been pondering this since your first post and was wondering if you thought about making your curtain double length to fold down when not using “Port Rowan” to keep the dust to a minimum. As for a drop-down valance as dust protector, I hadn’t thought of that. It’s an interesting idea. But there are places where the valance is only 6″ deep or so. It would not work to use the valance as a dust barrier. Looks great Trevor! The dark valance lets the eyes be drawn in to the scene, and I love the idea of not hearing periodic “thuds” as craniums connect with the overhead. Just ask Pierre….. I ran a train this evening and as you note, the valance really does focus the attention on the layout. I’m glad I’m installing it. Come over sometime and we’ll run a train! I saw your article in the Layout Design Journal on Breaking Marley’s Chains and came to your blog and subscribed. I have enjoyed reading your posts and learned a lot and have ‘stolen’ some really neat ideas! 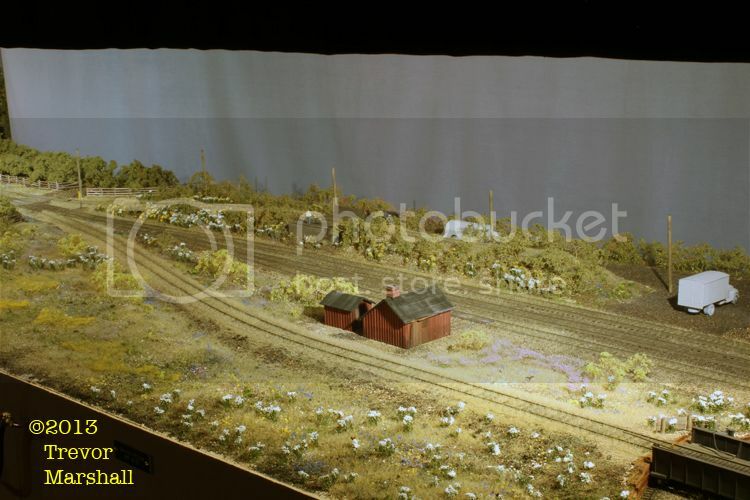 I model in N Scale, I’m looking into a couple of possible Prototypes (part of my problem is I’ve yet to meet a Railway I didn’t like! Like your recent Aroostook Valley), but I know that it will be either a branch of a class one or a shortline. 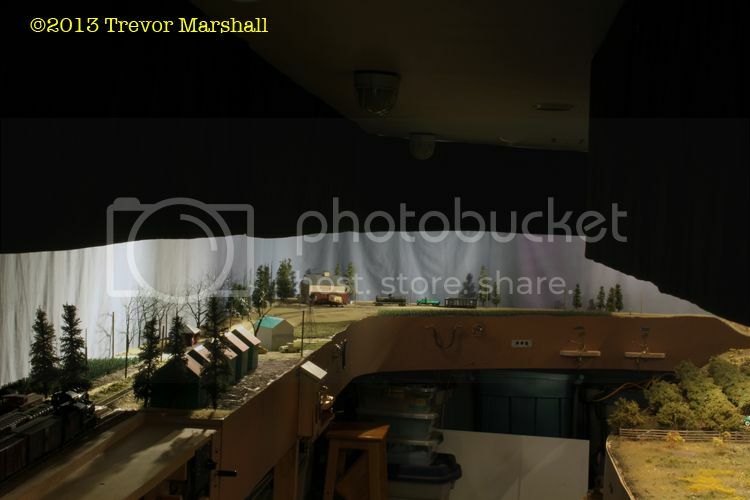 Your post of March 3rd on running a freight is just loaded with ideas that have far wider appeal then just ‘some obscure Canadian branchline in S scale’ (no offense intended, three of my favorite lines are the PGE/BCR, E&N and the KVR). Too often people seem to get fixated on ‘it’s not my scale/era/prototype’, but I try to read everything regardless and sometimes, in spite of myself, learn a few things. I do have a question, looking at the photos, I’m curious as to your layout height, I tried to do a search, but I can’t seem to find anything, would you satisfy my curiosity? Thanks, and keep the great postings coming! You asked about layout height. I’ll write a post on that, with photos to help explain my decision. Stay tuned. Excellent blog Trevor. Nice to see the fabric valance idea. Inspiring. Looking good, although if that it your eye level, and you’re shooting for “theatrical presentation”, my gut instinct would be to run the layout datum track height higher (closer to eye level). How does the layout look is sitting on a bar stool or similar (IE dropping eye-level by, say, 6″)? Good thoughts as always – and by coincidence I’ve written a post about layout height. It explains why I’ve chosen the height that I have. Thank you Trevor, I look forward to reading the post. Thank you, I’ve read and even replied to it. Appreciate the info.